If you're unhappy and tired of shaving or waxing to remove unwanted hair, laser hair removal may be an option for you. Lasers are useful for removing unwanted hair from face, arms, legs, underarms and other areas. It is a medical procedure in which a laser - an intense pulsating beam of light, is passed to remove the unwanted hair. 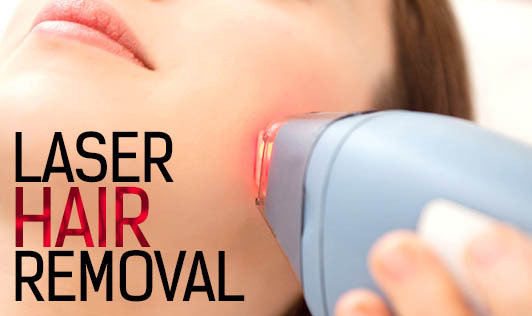 A laser beam passes through the skin to an individual hair follicle during laser hair removal. The intense heat damages the hair follicle thus inhibiting future hair growth. It is most effective for people with light skin and dark hair. Laser hair removal effectively slows down hair growth but does not guarantee permanent hair removal. It usually takes several laser hair removal treatments for an extended hair free period. Some individual's hair could be resistant to the laser treatment and may grow again after treatment. But the new hair growth may be finer and lighter in colour. Temporary discomfort and redness are quite common after the laser hair removal and the signs and symptoms usually disappear within several hours after the treatment. On the other hand, laser hair removal may darken or lighten the affected skin, often temporarily. It is very uncommon that laser hair removal can cause crusting, blistering and scarring or any other changes in skin texture. The results of laser hair removal vary from person to person. If you are interested in laser hair removal, it's essential for you to choose a doctor who has experience with laser hair removal and discuss the risks, benefits as well as expectations of the laser hair removal treatment.